These falls are relatively easy to get to, and the river is accessible to vehicles. For me the best part is that there is a deep pool below the waterfall at the point of return and all you have to do is simply follow the Goldsborough river upstream until you get there. However there are two ways of doing this. If you want a guide there is a good one who’s name is Curtis Simon and he can be located at the office of the representatives which you will find at the second turn off after the Goldsborough bridge which you cannot miss as it is currently being replace. At the office as for Lisa and she will help find Curtis. Alternatively call him on his cell 726-1364. He will take you and your vehicle down the dirt road, past rainbow resort, across the ford, through the coco plantation to the river. At this point you leave the vehicle and walk up river. Alternatively if you should want to do this on your own, take Pig Farm road, which is the turning on the left after Goodwood high school and before the bridge. Follow this for ten or so minutes until the road turns left and is bounded on the right hand side by an obvious hedge. Throughout this part of the walk the river is wide and shallow so you can walk for the most part on gravel and small rocks which form an easy walkway. Occasionally the river becomes a rapid but I have taken people from 5 to 70 and no-one found and major problems. Taking the tributary on the right, the valley closes in with more varied vegetation. The rocks seem too and you will lose speed as you pick your way carefully over them still it does not hinder those with bad knees, slippery shoes or simply people with a less well sense of balance. In other words no one needs to be daunted and then, turning a sharp corner in the river, you are faced with the falls themselves. The total height of the falls is large but they are broken up into a series of small falls. At the bottom there is a big fall and below a deep cool pool offering fun and entertainment for those who venture in. The total time taken to get there was about 45 minutes. Take time here to enjoy the scenery, the sun, the tropical rainforest all around you and for those needing an adrenaline rush, climbing the rocks around the pools. The return is the same way you came, down river. 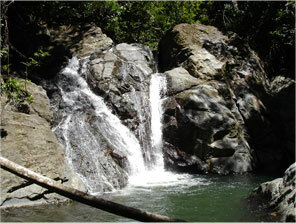 For the trepid explorer there is one deviation from the outward journey…an opportunity to swim Tobago’s own gorge. Continuing in the river past the track you came down on, the river narrows and passes between high rocks with a channel of some six feet in width. The river here is deep and has to be swum. It is a short distance and there is no comparison with the gorges of Trinidad, but nevertheless if offer’s a bit more than just a walk back. If you want to use the track, remember to take the right turn where the huge samaan trees are so that you can get back to the river and your car! This is probably one of the most satisfying walks in Tobago as its not strenuous, nor dangerous. BUT if the weather has been bad before you go you can expect the river to be higher than normal and should more rain fall there is a danger of a flash flood. This may be all right downstream but up near the falls the narrowness of the valley would make the trip dangerous to say the least. Go when it is dry and has been dry for several days and you will be quite safe!